SafeWise, the leading resource for all things safety and security, announced today the release of it’s 20 safest cities in Utah report for 2019—with 65% of them reporting fewer than 20 total violent crimes. 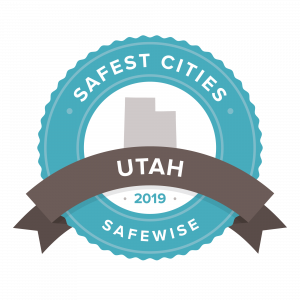 According to SafeWise, we are ranked #12 in Utah’s 20 Safest Cities Report for 2019. These rankings were determined by violent crime rate per 1,000 and property crime rates per 1,000. We scored a 0.68 and 23.28 respectively. To learn more, click here or visit safewise.com/blog/safest-cities-utah/.